More and more companies are realizing that employee recognition is not only a nice thing to do, but a necessary business practice. The first of May we are off to the races with Derby, quickly followed by Nurse's Day, Mother's Day, Prom Season and Graduation. Whew! Easter is right around the corner and we are READY! Our giant fudge-love truffle eggs are beautifully decorated and ready to go. Some would say they are too pretty to eat, but they won't be able to hold out for long. We also have bunny decorated oreo cookies that have been triple dipped in delicious chocolate, so good! Isn't it funny the things we cover in chocolate - marshmallow eggs, peanut butter chicks and bunnies, cookies and cream bunnies and fudge bunnies! Some of our Easter grab bags include; speckled malted milk eggs, candy coated chocolate covered marshmallows (my personal fav), peas and carrots (yes, the candy, not the veggies), bunny corn, sour bunnies, gum drops and mint lentils. Of course our everyday grab bags are awesome too - orange slices, cherry slices. cinnamon butter almonds, dark toffee almonds, peanut butter bites, chocolate covered raisins and peanuts, espresso beans - both in milk and dark chocolate, Greek yogurt covered blueberries and cranberries and of course, chocolate covered strawberries. 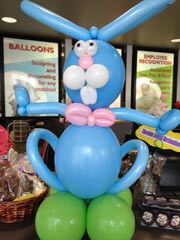 We also have some great balloon bouquets and balloon sculptures to celebrate the season. We would love to see you here at the store, but if you cannot make it in, please call us or order online! In January we are catching our breath from the holidays and preparing for one of our favorites...Valentines Day! It is so fun and exciting to customize a balloon sculptures in the name of LOVE! 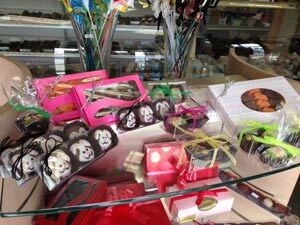 With gourmet chocolates, flowers, and balloons - we are your go-to shop! Balloon décor provided for the Pinktober celebration at the Hard Rock, Fourth Street Live in Louisville. Thanks Max 102.3 for all your contributions to this event! Super balloons decor ideas and yummy fall candy at Ah, Whatta 'Bout Mimi. © 2019 Ah, Whatta 'Bout Mimi!.